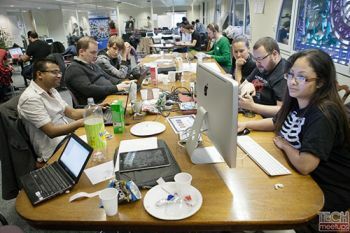 Drawing on the enhanced multimedia possibilities of the HTML5 mark-up language for Cloud computing technologies, teams of students, software developers and designers will compete at City University London to come up with a prototype application (or app) in 48 hours. The event, which demonstrates City's distinctive role in Silicon Roundabout and Tech City, is a collaboration between TechMeetups.com and City's Professional Liaison Unit. TechMeetups.com is a London-based organisation established to create a global network of tech communities, with the belief that great things can be achieved by making connections both within UK cities and outside the borders of the UK. Joining TechMeetups communities is free of charge. Anyone thinking about creating their own startup business will have an opportunity to network with other developers, designers, marketers and investors at regular events, such as meetups and hackathons. The hackathon takes place over the weekend of 20-22 July in the Northampton Suite. The judging panel will comprise Sean Kane of Springboard Mobile; and Wes Biggs, co-founder and Chief Technical Officer of Adfonic. Both judges, together with John Le Drew, founder of Geeks.io, will also be on hand as mentors during the two-day event. All apps created will be evaluated on the basis of their usability, innovation, business potential and execution. Participants are free to choose a range of platforms - including Android, Windows Phone 7 or iPhone - to build their apps. "I first became acquainted with City University in December 2011 and I was impressed with the programmes offered in the School of Informatics - particularly the focus on Artificial Intelligence and User Experience. I think the pairing of City and TechMeetups is an ideal one". "We are very excited to be hosting the hackathon this year and we look forward to welcoming all of the participants to the event. We are continuously looking to engage with the local digital community. By hosting events such as the HTML5 and the Cloud hackathon, we aim to encourage greater collaboration between our students, staff, alumni and the immediate local community". For more detailed information on the event, please visit the hackathon website.